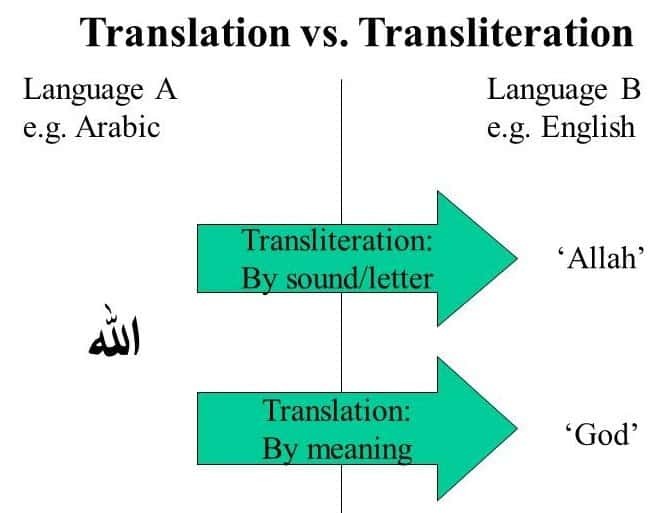 A translation is when a translator takes the text of one language (i.e., Greek, Hebrew and Aramaic), which is unreadable to the majority of Christians and converts it to the equivalent text in English (or the common language for another culture). However, the problem with translation is that there is not always an equivalent text from one language to another. We don’t just have different words; we have different sentence structures, different figures of speech, and some words which have no match in a different language or which carry different connotations and nuances. Sometimes translators will use a similar term and then expand the text to include a definition within it. But in many cases, when translators come across a word with no exact English equivalent, they will just skip translating that word entirely. The best way to see how all this works is with several examples. Angel (G32) is a transliterated word. It comes from the Greek word aggelos, which literally means “messenger” or “envoy.” When we hear the word angel, we usually think of a heavenly being with wings, but such a meaning is not actually present in aggelos. However, in many examples, these messengers were indeed beings sent from heaven. In some cases, the biblical authors were referring to these beings when they used aggelos, while in other cases they just meant normal human messengers. We could draw a similar parallel with the Hebrew use of the word alien (H5237). An alien is someone who was a foreigner. The Bible uses this word to refer to human foreigners (Ps 69:8). However, the word has gained an extra connotation so that it is often used to mean a foreign being from outer space. The New Testament authors went back and forth between using aggelos for heavenly beings or for human messengers. Many English translations try to reflect this by going back and forth between the transliteration and the translation respectively, yet this can be problematic as well, as sometimes the true meaning is ambiguous. Take, for example, “the angels of the seven churches” (Revelation 1:20, NASB). Were these heavenly beings assigned to those churches? Or were they the human messengers for the churches?